Reneltta Arluk is Dene and Inuvialuit from the Northwest Territories. She is a graduate of the BFA-Acting program from the University of Alberta and founder of Akpik Theatre, a professional Indigenous Theatre company in the NWT. Raised by her grandparents on the trap-line until school age, being raised in a nomadic environment gave Reneltta the skills to become the artist she is now. 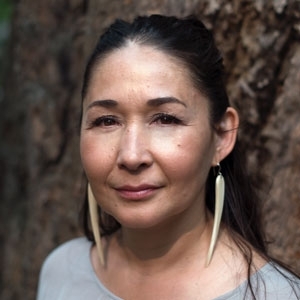 For over ten years Reneltta has been part of or initiated the creation of Indigenous Theatre across various parts of Canada and overseas as an actor, storyteller, writer and producer. “Keeping Culture Alive,” as her mom would say.